The debate between William Thomson, who would later be ennobled as Lord Kelvin (1824 –1907) and the followers of James Hutton (1726–1797) demonstrates a difficult period in the history of nineteenth century science in which the figures who are traditionally regarded as the fathers of modern geology (Hutton) and biology (Darwin) where pitted against Lord Kelvin, who is still considered one of the founding fathers of thermodynamics, and thus of modern physics. The point which brought these figures into conflict was the argument surrounding the age of the earth. Hutton’s and Kelvin’s methodologies were in some ways very similar, particularly in their views on the uniformity of nature and the demand for evidence of a beneficent being who created the natural world. Furthermore, both were forced to appeal to secondary causes when trying to defend their positions. Where they differed substantially was in their understanding of eternity in the larger framework of how the creator expressed himself in the world and how this related to the human ability to understand it. It would be too easy to phrase the debate between Kelvin and the geologists as a conflict between empirical evidence and religious prejudices in nineteenth century science. Indeed, Kelvin himself gave ample evidence that he worried about the theological implications of the geological and evolutionary theories of his time. In an 1872 speech to the British Association for the Advancement of Science, Kelvin concluded his discussion with a reaffirmation of these worries in the “zoological speculations” of contemporary biologists, stating that: “Overpoweringly strong proofs of intelligent and benevolent design lie around us […] showing to us through nature the influence of a free will, and teaching us that all living things depend on one everlasting Creator and Ruler”. Presumably, Kelvin felt that the vast time scales proposed by Hutton, Lyell and Darwin would remove the need for a creator in the universe and infringe on the free will of humans. Yet in this assumption we are all too quick to ignore the unorthodox religious views which led Hutton to formulate his self perpetuating “world machine”. As laid down by one of his more eloquent proponents, John Playfair (1748–1819), this perpetuity is ultimately maintained by God, for the author of nature: “has not given laws to the universe, which, like the institutions of men, carry in themselves the elements of their own destruction. He has not permitted in His works any symptoms of infancy, or of old age, or any sign by which we may estimate either their future or their past duration”. The world had obviously been created for the benefit of the things living upon it and for human beings in particular, and it would not have been fitting for a wise and omnipotent being to create it as anything other than eternal. As is clear from Playfair’s statement, it was this very indefiniteness which was the sign of divinity. While the system itself was indefinite, as a product of God’s wisdom, once started the world machine would perpetuate the specific cycles of uplift and erosion unendingly, maintaining the various balances which were necessary for life. In the case of Kelvin, the situation is aptly summarized by Burchfield in his work Lord Kelvin and the Age of the Earth, for “it was the belief in design that justified the formulation of universal scientific laws, that assured the relationship of cause and effect, that, in short, made science possible”. Considering Hutton’s religious views, it seems very unlikely that he would disagree with this statement. The science of both men was deeply integrated with their theological conceptions of how a wise and omnipotent God would construct an orderly world. Likewise, Kelvin and Hutton’s intellectual defender, Charles Lyell (1797-1875) largely agreed on the actualism of causation, in which the same kind of causes have been at work at all times, and held similar views of uniformitarianism, in which the same causes have been acting with the same intensity over time. As Lyell formulated it, through: “researches into the state of the earth and its inhabitants at former periods, we acquire a more perfect knowledge of its present condition, and more comprehensive views concerning the laws now governing its animate and inanimate production”. This was also the case for Kelvin, for whom logical consistency “required that since the discovery of the primitive state of matter is beyond man’s power, if one is to find a probable beginning, he must start with the present condition of nature and reason back by analogy and strict dynamics”. The situation is somewhat less definite in regards to the two men’s approaches to uniformitarianism. As it was generally argued, Kelvin was clearly antagonistic to the idea as he understood it. However, in his work On Geological Dynamics, Kelvin specifies that he is opposed to what he called “ultra-uniformitarianism”, and otherwise speaks approvingly of other similar movements in geology: “The geology which I learned thirty years ago [embodied the fundamental theory of] Evolutionism. This I have always considered to be the substantial and irrefragable part of geological speculation; and I have looked on the ultra-uniformitarianism of the last twenty years as a temporary aberration worthy of being energetically protested against”. When seen in this light, Kelvin’s affinity for certain forms of uniformitarianism becomes more evident and shows the difficulties in strictly drawing a line between the methods employed by proponents of the young earth and those of the old. This subtlety is clearly shown when one considers Kelvin’s argument presented by On the Secular Cooling of the Earth, in which he states “that essential principles of Thermo-dynamics have been overlooked by those geologists who uncompromisingly oppose all paroxysmal hypostheses”. Immediately following this Kelvin makes it clear that he is not a catastrophist in the traditional sense of the word. For him: “It is quite certain the solar system cannot have gone on even as at present […], without the irrevocable loss (by dissipation, not by annihilation) of a very considerable proportion of the entire energy initially in store for sun heat”. The distinction between annihilation and dissipation is a crucial one. Not only is it a reaffirmation of the first law of thermodynamics, but it also opens the door to a different kind of unimformitarianism than that typically attributed to Lyell or Hutton. It is one in which there can be a uniformity of causes without a corresponding uniformity of effects. The causes themselves have been acting at the same intensity; however, their effects have varied over time because of the limitation placed on them by the second law of thermodynamics. The laws are the same, the causes are the same, yet as Kelvin says: “the secular rate of dissipation has been in some direct proportion to the total amount of energy in store, at any time after the commencement of the present order of things, and has been therefore very slowly diminishing from age to age”. The rate of the dissipation would vary in proportion to the total amount of energy in store, producing effects of varying intensities despite the uniformity of the causes governing them. This crucial distinction is what allowed Kelvin to criticize Playfair’s statement that only a direct act of God could bring about a catastrophe like the one implied by Kelvin’s thermodynamic approach to the age of the earth. Playfair concludes the passage by stating: “we may safely conclude that this great catastrophe will not be brought about by any of the laws now existing, and that it is not indicated by anything which we perceive”. Kelvin, however, found a grave error in this view of uniformity. Indeed, he saw it as being: “pervaded by a confusion between ‘present order,’ or ‘present system,’ and ‘laws now existing’—between destruction of the earth as a place habitable to beings such as now live on it, and a decline or failure of law and order in the universe”. Thus it is evident that he did not contest the validity of uniformity itself. Kelvin contested what he saw as a narrow view of uniformity that could not derive universal laws from the present order of things within the finite framework of the solar system, but instead was forced to posit an indefinite standpoint in order to make its system scientifically valid. Thus, when looking at Lyell’s three main tenants of actualism, uniformitarianism and cyclicality, it is only the underlying principle of cyclicality which differs substantially from Kelvin’s own thought. What, then, can be said about the fundamental differences that divided Kelvin’s thought from that of the geological community of his time? These differences can not appeal to the specious distinction between science and religion in either camp, since their religiosity was almost identical in its demands for an ordered, benevolent deity which made science possible. Rather, the question was what that beneficent order would look like. Likewise, one can not make appeals to the demand both groups placed upon their thinking in regards to the stability of causality which made scientific inquiry into the past possible. Where they did differ was in the objects of study which each group took up to defend its claims, and how these objects could in some ways only be viewed indirectly. It was the indirectness of secondary causes which left both groups open to criticism from the opposing camp and perpetuated the debate for almost forty years in Kelvin’s lifetime alone. At the heart of the matter, however, were the conflicting views of eternity which formed the basis of both Hutton’s, as mediated through Lyell, and Kelvin’s visceral opposition to the other’s work, about the circularity or progressiveness of nature. It would be helpful here to provide some explanation of what is meant by secondary causes. Secondary causes in this case would be any cause which must be appealed to in order to get to a more primary cause which can not be directly observed. Since it is not possible for people to actually see the effects of time in geology over thousands or millions of years, it is then necessary when explaining its effects to point instead to the effects of things such as the dissipation of heat, uplift, layering, and erosion. Once these explanations are found it is then possible to work backwards from the causes of these effects to the prime cause, whether that be the formation and age of the earth itself or the formation and age of a specific mountain range. 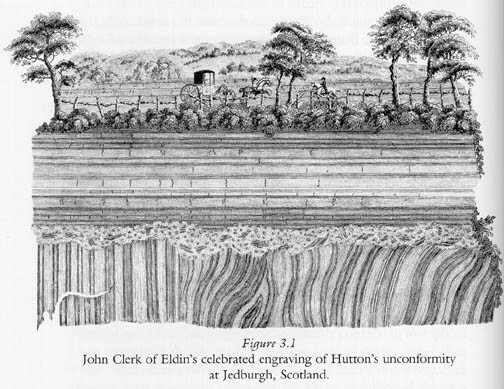 Hutton, in exploring the age of the earth, took as his object of study the layers of the earth itself. As first this consideration seems to go without saying, yet it is important to note that this was not the case with Kelvin, who instead dealt almost exclusively with the nature of heat, and the ability of the earth to support living things. Both of them were looking at secondary causes to demonstrate their positions, one in the effects of unimaginable time on the earth itself and the other at the age of the suns heat. The nature of their particular observations made both arguments vulnerable to their own particular criticisms. The discovery of unconformity in geological strata demonstrated to Hutton a key mechanism in the circularity of geological processes. Unconformities are the remains of geological strata which have been displaced from their horizontal alignment and instead now occupy a vertical position relative to the above strata (see appendix 1). The conclusions which were drawn from this phenomenon were most artfully stated, once again, by Playfair: “We often said to ourselves, What [sic] clearer evidence could we have had of the different formation of these rocks, and of the long interval which separated their formation, […] Revolutions still more remote appeared in the distance of this extraordinary perspective”. Unconformities had the effect of breaking down older geological strata, in some ways erasing the records of past time. Their existence was a vital part of Hutton’s argument for a cyclical earth, and represented his most direct evidence that the age of the earth was not something limited by either past or future ages. This kind of “direct” indirect evidence demonstrates the problem facing any purely geological inquiry into the age of the earth. Hutton and his followers, when considering the single system of the earth, could only consider what incidental evidence was left over for them after years of intervening phenomenon had had a chance to bury and destroy the very evidence they were looking for. This naturally left them with an indeterminate number of cycles continuing without apparent end. True, they were shown an example of the vast time scale on which geology operated, opening up the door to a more complete depiction of the age of the earth; however, they were unable to derive any further evidence for these same cycles except to point, rock hammer in hand, at the immense times required to lay the cycles down in the geological strata. Outside of this they could only appeal to base principles of what was required for life and a beneficent deity. The instability of these secondary causes would continually leave the early Uniformitarians open to accusations that they had not sufficiently grasped the physical and mathematical laws governing their field of study, while their very same field of study seemed to deny any attempt at strict quantification because of the same order that made it observable in the first place. 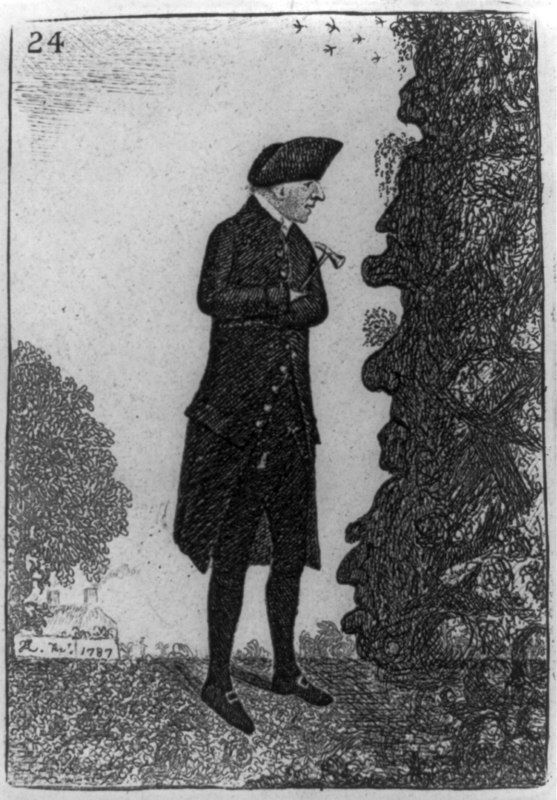 The problem Kelvin faced was somewhat different, though directly related to the difficulties of secondary causes in quantifying geological time. Taking as his object of study the dissipation of heat, and armed with the mathematical tools of thermodynamics, Kelvin would at first glance appear to have a better standing when it came to quantifying the age of the earth. Yet here too Kelvin was confronted by the same bugbear of secondary causes as were his intellectual opponents. Kelvin hoped to use the second law of thermodynamics to help guide his calculations into the age of the earth. The second law of thermodynamics lays down that energy is always moving from a more ordered to a less ordered state, the most disordered form of energy being heat. For example, a cup of tea in a cold room will never become warmer while the room cools, but will continue to loose heat to its environment in a predictable manner until both the room and the tea reach a state of thermal equilibrium. It was this predictable rate of dissipation which Kelvin hoped to use as his indicator in much the same way as radioactive decay is used today to determine the age of objects. Kelvin used mathematical principles guided by the second law of thermodynamics in part because he could not look to the earth itself when in need of placing a definitive limit on its age. Here the quantitative factors were still too murky, and in some cases were directly hostile to his position. 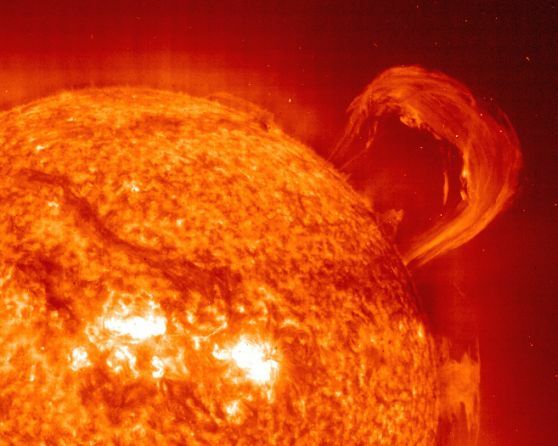 Rather, in using the definitive measure of heat, and taking as his object the age of the sun, he could hope to be able to fix the age of the earth by binding it with that of the sun which could not be studied qualitatively, but only quantitatively. This appears to have been his intent. In a thirty-one year span Kelvin worked out his calculations drawing the age of the earth ever closer to the common estimate of the age of the sun, so that the age of the earth went from being twenty and four hundred million years, compared to the sun’s twenty million years, to a number set at twenty-four million years. Fundamentally, however, the precision of his calculations in placing limits on the age of the earth was secondary to his main goal of firmly establishing that such limits actually existed. As Burchfield says “The inexactness of his calculations was […] unimportant so long as they established the necessity for a limit upon geological time and the impossibility of uniformitarianism’s demand for limitless ages”. Still, since Kelvin took as his object the sun, which could only be known quantitatively through astronomical means, he was nevertheless open to chargers of miscalculation, and to criticisms of the roundabout way in which he sought to fix the age of the earth. Given the difficulty inherent in any definitive resolution to the problem of the age of the earth, then, we must look even further into the primary goals Kelvin and Hutton hoped to achieve in their world systems. In doing so we see that the matter was largely a reflection of the different ways in which the two men viewed the nature and dangers of the concept of eternity for human kind, and for the very possibility of reason in natural philosophy. Hutton’s cyclical conception of the world took as its model Newton’s cosmos, infinite in space, whose motions where perfectly balanced in the orbits of the planets. Yet where Newton’s cosmos was infinite in space, Hutton’s world would focus on the infinity of time. The balancing of forces which maintained the planetary orbits was analogous to the balancing forces of erosion and uplift which maintained the succession of worlds. Yet the movement from an infinite cosmos to an eternal world is not without its difficulties. Hutton’s world machine made a radical statement about the nature of history, and implied a more enclosed system than the Newtonian cosmos. Still, Hutton often drew the comparison between the cycles of the planets and the cycles of the earth. [W]e have the satisfaction to find, that in nature there is wisdom, system, and consistency. For having, in the natural history of this earth, seen a succession of worlds, we may from this conclude that there is a system in nature; in like manner as, from seeing revolutions of the planets, it is concluded, that there is a system by which they are intended to continue those revolutions. […] The result, therefore, of our present enquiry is, that we find no vestige of a beginning,–no prospect of an end. For Hutton, as is evident from this excerpt, it is the eternally cyclic essence of natural phenomenon which makes it possible to logically observe systems in the world, which to a large extent makes them knowable. Without these cycles the most we could observe would be incidental phenomenon, insufficient for the development of universal principles. This demand upon knowledge has a surprising consequence. Natural phenomena are understandable insofar as they are cyclic in nature. This can be seen in the progression of animals, plants, climate and geology. However, human history, insofar as it focuses on particulars is unimportant, and potentially can not really be seen to exist at all. While this passage is almost universally held to mark the introduction of the idea of heat death, it also serves as a refutation of the very same possibility. Rather than asserting that the dissipation of heat will lead to an eventual extinguishing of all life, Kelvin instead posits a universe in which the second law of thermodynamics insures a continued activity of matter, directed and given order by the transformation of potential energy into motion and heat. Thus Kelvin was driven to establish a firm limit on the beginning of the earth in order to make his view of progression make sense in light of the fact that time in the universe had a direction, but no observable ending. While the earth itself may be limited and thus doomed to dissipation, the universe itself faced no such restriction. This meant that the very thermodynamics which made the universe run was threatened by the Huttonian world machine, for if the earth was composed of eternal cycles, thermodynamics was in error, and, perhaps more unforgivably, the whole notion of progression in time. Furthermore, as has already been seen in Kelvin’s critique of “zoological speculations” in his 1872 speech, he was deeply worried about the effect geological and biological studies would have on the free will of humans. It was the indefiniteness of time which gave Hutton’s position the capacity to deny human history, which would rob individuals of their efficacy in the face of a world in which everything was repetition. Kelvin’s view of endless progression, however, would avoid this misevaluation of the will through its directionality. This directionality insured a firm ground for knowledge, insofar as universal laws could be derived from constant causes, but one whose effects could vary over time, a fact which, for Kelvin, also insured the purposefulness of human experience. Ultimately, the similarities between Kelvin’s and Hutton’s approaches were striking considering the radically different conclusions which they drew from them. Both used almost identical assumptions about the uniformity of nature, with the exception of Hutton’s demand for circularity and Kelvin’s distinction that a uniform cause can produce a different effect given a different substrate. Likewise, both were led by strong religious convictions about the kind of order a beneficent god would establish in the world. What caused the contention in determining the age of the earth was the presuppositions they made about what that divine order would be like, whether it would be an eternal cycle or an eternal progression and what this would mean for both natural philosophy and the individual. In the age in which the problem was raised the conflict could not be satisfactorily resolved, and it was perpetuated by the ambiguous nature of secondary causes which both theories were forced to rely upon to prove their separate claims. In the end what can really be learned from this debate is the vital capacity for similar methods and guiding principles to lead to dramatically different results given but a handful of separate core convictions. This tendency is only magnified in any system of knowledge which requires an indirect view of its subject matter. In such cases all positions must then suffer the capricious whims of the secondary causes upon which they, nevertheless, must rely. Burchfield, Joe D. Lord Kelvin and the Age of the Earth. London: The Macmillan Press LTD, 1975. Gould, Stephen Jay. Time’s Arrow, Time’s Cycle: Myth and Metaphor in the Discovery of Geological Time. Massachusetts: Harvard University Press, 2001. Hutton, James. Theory of the Earth with Proofs and Illustrations. Vol 1 and 2. Weinheim: H.R. Engelmann (J. Cramer) and Wheldon & Wesley, LTD., 1960. Knell, Simon J. and Cherry L.E. Lewis. “Celebrating the Age of the Earth”. In The Age of the Earth: from 4004 BC to AD 2002. Eds C.L.E. Lewis and S. J. Knell. London: The Geological Society, 2001. Lyell, Charles. “Principles of Geology” in 19th Century Science: An Anthology. Ed. A.S. Weber. Canada: Broadview Press Ltd, 2000. 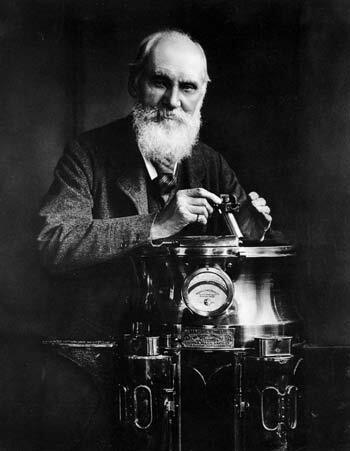 Thomson, W. (Lord Kelvin). “Popular Lectures and Addresses”, vol. 2. As in The Age of the Earth: from 4004 BC to AD 2002. Eds. C.L.E. Lewis and S. J. Knell. London: The Geological Society, 2001. This entry was posted in 1. My Pages, Academic, England, History, Nineteenth Century, Scotland, Wissenschaft and tagged Age of the Earth, Geology, History, Hutton, Kelvin, Nineteenth Century, Physics, Religion, Science, Time.